It’s a show as riveting as it is uncomfortable. 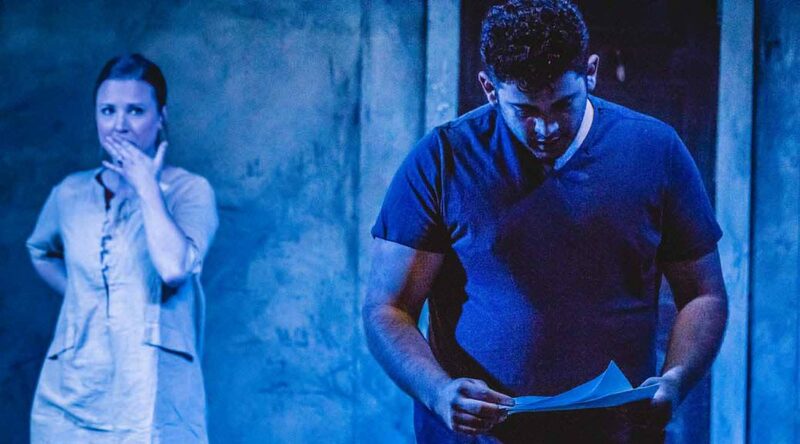 “In the Canyon” creates a dystopian world where past abortions are criminalized, while simultaneously challenging the audience on their views on other controversial issues. The play, extended through Dec. 1 at the Jackalope Theatre, 5917 N. Broadway Ave., follows the story of Hope, one woman who fights reor control of her life under increasingly oppressive circumstances. The show presents a series of vignettes, beginning in the early 2000s, on the day Hope has had an abortion. As each scene unfolds, the world Hope lives in becomes increasingly oppressive, hateful and authoritarian. She arrested and imprisoned for her past abortion. While the show uses abortions as a catalyst, it touches on LBGTQ rights, power, child abuse and religion. “We need to be openly talking about these things,” said Liz Sharpe, who plays Hope. Nearly two years ago, Sharpe was one of three women who gathered to workshop this show, which finally debuted October 23. Sharpe joined Chicago-based writer Calamity West and director Elly Green in the process. Like Sharpe, Green wants people to explore the play’s theme of criminalizing women’s bodies, and then enact changes in their own lives. “It’s a call to action in many ways,” Green said. We sat down with Sharpe and Green to talk about what they called an “ideal project,” since it told a story about present day America that would also lead its audience imaginatively into the future. Their answers have been edited for clarity and brevity. Since this play had been workshopped for two years, how has the story evolved over time? Sharpe: The whole play in general just kind of built on itself and changed and evolved as the political stances happened over the past two years. But also, to be perfectly honest, it hasn’t changed immensely, as far as the subject content goes and the dystopia. Since we’re reading further into the future with this show, it is basically what [West’s] mind saw originally. It’s just unfortunately becoming more and more accurate as we look at it. Why do you think the play, which contains a heavy dose of unsettling tension, resonated with many audience members? Green: It a believable version of our future, but it also isn’t without hope. It isn’t without a sense of a fight and resistance. How was the cast able to achieve the incredible tension each scene evoked? Sharpe:In the script there are long pauses and beats … where Calamity wanted tension to be held in those moments. So I think the point of a good script and a good production is that, as actors, we make the audience feel like they’re in the room with us, and that everything that we’re going through, they’re going through in a sense. This play is very much like a movie to me to where we don’t care about clipping it along for the audience. We want them to sit there. How have the actors had to work through their own response to the show’s content? Sharpe: Part of your job is to be able to take care of yourself when you’re doing something like this and giving the audience a certain kind of story. It’s not very easy. It’s hard to like compartmentalize your actual life to what you’re playing on stage sometimes when it’s so close to home. But we do a good job of taking care of each other. We make each other laugh a lot. We talk about things when they’re hitting too hard. Can you tell us a little bit more about the male characters in this show since the roles they play are often convoluted and complex? Sharpe: I think Calamity tried not only to write complex characters, but also wanted the audience to understand that this show is not for men. It’s not about men. This is about point in time where the focus needs to be put on what women are going through. What have you personally learned from playing the character Hope? Sharpe: As a queer woman I’ve never been through an abortion before. But I have helped many of my friends through them. I was the person in college that took all of my friends. I also learned an immense amount of information about abortion laws of the past in our country and in other countries, like what we’re going through now. What do you think the meaning the audience should take away from the show? Sharpe: I hope they walk away knowing that all of this has happened before. Everything that’s in this play has happened before. The fact is that it is very, very possible of happening again. I just want people to maybe walk away from this, to go home and do some research and look up what has happened to women in the past, look up and see what our abortion laws are in states and in our towns and our entire country as well. And what it means to be pro-life or pro-choice. What that actually means, what the pros and cons are for each one. I want people to make their own decisions on where they stand walking away from this. This is our life. All of these decisions are our choices and I want people walk to walk away knowing that that is a fact and not something that should be up for debate. Green: I would never want to prescribe how an audience member receives the play or what their takeaway of it is. I think what each person takes away from the play will be individual, and we want to make sure we are allowing that individual response. So [it’s] giving people the chance to fill in some of the gaps in the play themselves, giving people the permission to enter the debate themselves in terms of what sort of story they’re reading, and what reality they’re piecing together through the vignettes.